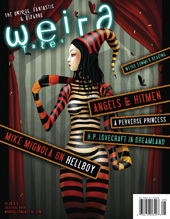 Weird Tales magazine recently hosted a spiffy flash fiction contest. The challenge: write a piece of fewer than 500 words based on a SPAM email. Well, gosh. I have a host of collected SPAM to choose from — some of them artful in their painful obfuscation and stilted Engrish — so choosing was half the battle. My [losing] entry is below. I strongly regret any inconvenience the receipt of this message may cause you, bearing in mind the nature of its content coming from an individual without referral or prior correspondence, but please read and assimilate its content and objectively consider if we can work together. from your sun. Please call me Phil. I should like to intimate you with certain facts that I believe would be of interest to you. My delegation represents the totality of the peoples of Ç¤§Þ¤°¤ currently en route to your coordinates. I communicate with the authority of the director of our trade delegation to your peoples. economical wants. Your recent Happy Days transmission we find joyful. (Fonzie. Ayyyyy.) Your Hitler program we had enjoyed not so much. Due to unforeseen consequences with a neutron particle colliding experiment a substantial portion of our home world’s atmosphere was discharged, rendering our home world unhabitable. Hey, mistakes happen. As a consequence, we wish to secure rights to Solar planets Sol-d (Mars), and mineral rights or perhaps a lease / purchase agreement for Sol-e (Jupiter). Exchange of biological specimens would be advantageous, but is not a requirement for our sustained and mutual cooperation. With great anticipation of a mutually beneficial partnership and durable relationships. I am of great interest in this gift. Please to forward me your bank account details that I may build a space rocket for my visit to it. Thanking you today greatly. I am yours. Even without the trophy it was a good story.